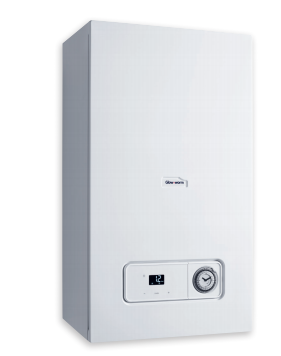 DISCONTINUED.The Procombi Essential 28kW is a Combi gas boiler which has been designed and manufactured by Glow-worm. It is a condensing wall mounted unit which has a variety of features and benefits which result in a highly reliable boiler. As a Combi boiler is does not require an external water tank or cylinder as everything is wrapped up into one cost effective unit. This makes it perfect for those properties where space is limited. The boiler is A rated as it has an efficiency rating of 89.2%. The output rating of 28kW makes the unit perfect for medium sized properties which do not have a high demand for hot water or heating. This boiler is also available in a 24kW output for smaller properties. This boiler features a modern, bright LCD display and has a simple to use analogue timer and straightforward programming. The boiler is compatible with the range of Glow-worm controls including the mobile phone app based control which should enable you to monitor your energy usage in more detail. It includes a high grade aluminium heat exchanger and a Grundfos modulating pump for greater performance. This boiler comes with 2 years warranty as standard to give you peace of mind that you are getting a highly reliable unit which won't let you down.